Climate change is driving more extreme weather patterns that we are all too familiar with. Investment in flood defences is protecting vulnerable property from river and sea flooding, but surface water flooding can happen anywhere at any time, with groundwater creeping up unawares often a month afterwards. Revised guidance for conveyancers on flood risk to protect their clients is in place. There is a clear duty of care to provide the clearest understanding of what types of flooding have occurred in the area and how this could impact on the insurability and lending on your client’s site or property. We combine the best in class data and expertise to forensically analyse how flooding has and could shape your client’s future asset. Comprehensive Environmental, Flood and Ground Stability risk report, plus unique air quality data and a “floodability” insurance rating. We partner with JBA Consulting to provide a range of affordable solutions that assist with residential property purchases where flood risk is identified in an environmental search. More Holistic, Proactive Flood Management Required. York has known devastating flooding many times before and if ever there was a city used to its ravages, its residents have felt it. Time and again, the city’s defences have been improved and adjusted, as new lessons have been learned – but Christmas 2015 raised the bar once again. 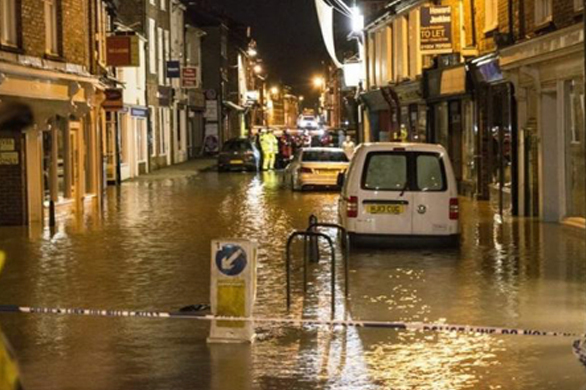 Over the course of a few days, York suffered its worst flooding in a generation. Storm Eva unleashed a wave of unprecedented rainfall across the north. Coming just three weeks after Storm Desmond, it exacerbated the ongoing situation, with saturated river catchments responding swiftly to the new deluge. York Flood Group – made up of the City of York Council, the Environment Agency, North Yorkshire Police, North Yorkshire Fire & Rescue and Yorkshire Water – met on December 27 to discuss the worsening situation. The group usually meets only when the River Ouse levels reach, or are expected to reach, 4.2 meters above normal summer level (asl). On Monday 28 December, the Ouse peaked at 5.2 metres above its normal summer level, just short of the all-time high of 5.4 metres, recorded in autumn 2000. However, city-wide flooding occurred due to the devastating failure of the Foss Barrier. It was opened on Saturday 26 December after the pumping station was flooded, leading to floodwaters from the Ouse flowing back into the Foss. The primary concern was the pumps failing due to water ingress to the electrical supply. The Environment Agency said that if the Foss Barrier were not lifted, it could have jammed in the closed position, causing even worse flooding for 1,800 properties, as water would not have been able to discharge into the River Ouse. As a result of the decision, huge areas were flooded for the first time in many people’s lifetimes. Foss Islands Road was closed, Foss Bank and the river were indistinguishable, and several cars parked off Layerthorpe were almost completely submerged. About 500 homes alongside the Ouse, the Foss, Tang Hall Beck and Osbaldwick Beck were inundated. James Street travellers’ site was also severely hit, with many distraught residents saying they had lost everything. 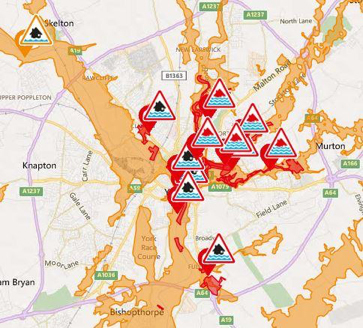 In total in York, 250 people were evacuated from their homes. Around 10,000 sandbags were used, with 600 military personnel, 125 mountain rescue members, York Rescue Boat teams and countless volunteers helping to rescue flood victims or to fill and distribute sandbags around the flooded areas. By December 29, the Foss barrier was operational again. The army flew in emergency equipment the day before and repairs were carried out overnight, but by then it was too late for many. Householders were left counting the cost and many business owners in the city-centre said they were given no warning the barrier was being lifted. At its height, the flooding caused major knock-on problems. Floodwaters swamped the basement of the BT telephone exchange, damaging electrical equipment and cutting landline and wi-fi broadband services for thousands of York customers. People across the city lost phone and internet connections, and many mobile networks failed or struggled, with some people unable to make or receive calls. Many buildings in the city-centre had no internet or phone connections and most shops, pubs and cafes were able to take cash payments only, as card machines were down. The Jorvik Viking Centre flooded for the first time in its 31-year history, and faced a closure of up to a year. The cells at York Magistrates Court also flooded, meaning many cases had to be moved to other courts. North Yorkshire Fire and Rescue’s High Volume Pump from Harrogate was used at the Melrosegate Electrical Sub Station to keep it going, preventing 55,000 customers from losing power. In the end, around 650 homes and businesses had been directly affected by flooding in the city centre. The cleanup cost the council half a million pounds, excluding damage to council assets including properties and infrastructure. It persuaded the government to pay £17m for Foss Barrier improvements and £45m for wider flood risk management improvement works across the city. The original Foss pumping station was designed to pump about 30 tonnes of water per second from the Foss into the Ouse and was clearly unable to deal with the demand that Christmas. The upgrade, which will include the installation of eight more powerful replacement pumps, is set to increase its capacity so it can handle at least 40 tonnes per second – securing its performance for the foreseeable future – or until climate change raises the bar again. 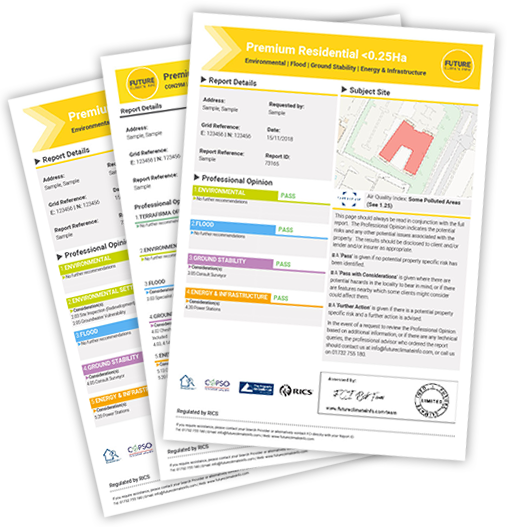 Future Climate Info provides a comprehensive flood risk assessment for residential properties through its suite of Environmental Risk Reports. These account for river, sea, coastal and surface water flood extents for a full, clear and effective view on any potential risks ahead of a property transaction. Based on the assessment, Specialist flood risk services can look at flood resilience measures and a review of flood zoning with climate change allowances can give an accurate appraisal of the likelihood of flooding into the future. It was a day most people in Leeds did not see coming, and one the business community in the city may never forget. Kirkstall Road, one of the main commercial streets in the city, was completely submerged under murky rainwater after a un-precedented downpour on Boxing Day 2015 from Storm Eva. Leeds experienced significant and widespread flooding from some of the highest river levels ever recorded. The flooding was centred on the commercial/industrial area along the A65 Kirkstall Road and Stourton to the south of Leeds railway station. Devastated business owners and residents paid the price – the deluge battered 3,355 properties in Leeds, 672 of which were businesses. Before this event, the closest comparison was in 2000 when around 100 properties in the city flooded. As shops, restaurants and bars prepared for a bustling Boxing Day, the Environment Agency issued a red warning – its highest alert, signalling “significant impacts to infrastructure and risk to life in the area”. Parts of the city centre, including Sovereign Street, The Calls and Clarence Dock, felt the full force of the deluge as the evening wore on. The River Aire at Crown Point, which is usually 0.9 metres high, rose to 2.95 metres at 1am on December 27. Its previous high was 2.45 metres, recorded in June 2007. Tyrannosaurus Pets, a specialist reptile shop on Kirkstall Road, was one business hit hard by the floods. They had animals in the basement, which the business owners rescued and moved upstairs as water was coming in through the door. It re-opened more than eight months later during the August Bank Holiday at a temporary location in Headingley. But parking was a major problem and the business lost trade while it was forced to relocate. The owner Matthew Pedder admitted that after a year away from their shop, it had been very painful. He knew of another firm down the Kirkstall Road that had put all of their life savings into a business and open two months before the floods only to see them lose everything. Ultimately, the direct cost to the city was an estimated £36.8m, with the cost to the wider city region being more than £500m, according to Leeds City Council. It was a wake-up call to protect the commercial heart of England’s fourth largest city. It had already spent £50m on a flood alleviation scheme which had started the year before covering three miles of river bank from Leeds train station to Kirkstall. This was the first time that flood defences had been placed along the River Aire. It was one of the largest river flood alleviation schemes in the country, designed to provide increased protection to more than 3,000 homes, 500 business and 300 acres of development land. Now, a second stage to the scheme is being proposed, which if the green light is given for the £112m investment, will see more ,measures being implemented along the Aire to Calverley. The difference with Phase 2 will be a catchment-wide approach, adopting a combination of Natural Flood Management (NFM) and engineered measures to help slow the flow and catch water further up the catchment so that flood peaks are reduced further downstream. The Phase 2 plans have a strong focus on NFM, with proposals to create new woodland areas with some 2 million new trees planted, doubling the canopy coverage in the River Aire catchment. Water storage areas will be created and developed, operated by a control gate system meaning water can be held and then released back into the river when safe to do so. A third element would be the removal of existing obstructions along the river to help reduce water levels, along with lowering the riverbed in places to improve its capacity and flow. constructing raised defences along the river which could include landscaping, terracing, embankments and walls. The aim is to achieve a 1 in 200 year standard of protection, but initial funding looks likely to go for a one-in-100-year level of protection using government funding supported by council and other financial support. Leeds demonstrates how behind the curve we still are with regard to protecting our commercial infrastructure in the face of ever more extreme rainfall events. It’s not alone as a city facing these problems. Leeds has a major river running through it and therefore the focus is managing the fluvial flow. It is far harder when you have surface water events from a local deluge. Another example where flood history has and will continue to affect commercial business includes Sheffield, where repeated flood events have been a principal reason for the proposed HS2 route to be diverted away to the east of the City. Business disruption through flooding is one of the single biggest issues facing commercial property owners or those looking for suitable premises. Future Climate Info provides a comprehensive flood risk assessment for commercial properties through its FCI Commercial Report. This accounts for river, sea, coastal and surface water flood extents for a full, clear and effective view on risks ahead of the transaction. Storms Desmond and Eva were two of the most notorious, destructive weather events in recent years. New rainfall records were set in the Lake District for a 24-hour period in December 2015, with 341.4mm recorded on Honister Pass. Cumbria was hit by a conveyer of water which swelled river catchments and bore down on residents directly in its path. At the height of the storms, some 45,000 properties were without electricity. Some 5200 properties were flooded, leaving the insurance industry with a bill of some £520 million, according to the Association of British Insurers (ABI), including £2.9M of emergency payments for residents to get their lives back together. This is double the amount of storms that hit the same region in 2009. Carlisle was especially badly affected, with some 2100 properties flooded. It lies at the confluence of two rivers – The Eden and the Caldew, which have highly responsive catchments that feed large volumes of surface run-off from the surrounding fells. The area immediately to the south of the Eden was worst affected, where the floodplain has been developed. In the town, properties in Warwick Road and Willow Holme Road were swamped with flood water up to the second floor. The peak flow of the River Eden at Sheepmount was 1680 m3/second, with the river depth peaking at 7.8m – a new record. Carlisle itself was cut off for some time, leaving residents stranded. Some had to be airlifted off the roofs of their homes. Evacuation was dangerous in darkness and high winds. 2.5 metres of water flooded the fire station and police station, limiting the support local first responders could provide. 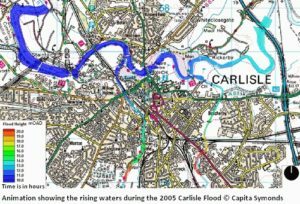 In 2010, a £38m flood defence scheme was completed for Carlisle in a bid to protect about 3,000 homes and businesses around the city. They were built in response to the levels of the floods in 2005 and 2009 and at least gave authorities more time to evacuate people. However, the unprecedented levels of rain were too much for them. Supposedly designed to contain flood levels long into the future, it took just 6 years to be proved inadequate and became largely the reason for the swift removal of the phase “1 in a 100 year event” by the Government and the Environment Agency – as this is clearly not the case anymore for these types of weather events. The Government gave temporary relief on business and council tax for homes and businesses. Among the major employers affected in Carlisle was the McVitie’s factory, which employs 640 people locally. The site was inundated by the River Caldew with substantial flood damage to electrical equipment and ovens. Nearly 40 million litres of water and 540 tonnes of debris had to be cleared before normal production at the site could resume, according to the owner United Biscuits. After three major flood events in a decade, the Environment Agency and Cumbria County Council have completed a major investigation and published new recommendations for ensuring it doesn’t happen again. This includes a package of even higher flood defences, which is welcomed by some but can be unsightly and out of proportion in some locations. For nearby railway lines and pumping stations though, it will provide greater resilience. A further £24 million is being invested in Carlisle, as part of a wider £72 million package for Cumbria to protect 4,300 homes and businesses by 2021. But building more walls and hard structures isn’t the only answer. Many hydrologists suggest that this just pushes the problem faster downstream. Better to think about how we manage the upland areas in the rover catchments, to slow the flow of run-off from the surrounding hills. To meet this in a more holistic way, the Lowther Estate is proposing to plant 213,000 trees over 170 hectares of the estate this winter. This recently-approved government-funded large-scale tree planting scheme will be one of the most productive woodland creation sites in England for more than 25 years. Trees and vegetation along river banks (called riparian planting) together with incentives for farmer and landowners to create natural dams will disrupt the speed or water flowing down into the residential valleys. It is not an instant fix, but combined with higher hard defences should give Carlisle a fighting chance for when the next storm will surely come.